Providing excellent facial coverage, this high quality neoprene face mask is wind and water resistant. 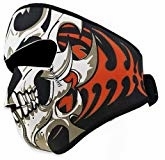 An excellent choice for bikers, it looks great under a helmet and/or with goggles as the Velcro enclosure ensures a great fit for any size head. Perfect for cold-weather, the lightweight mask also provides great protection as it is thin enough to feel a hit but thick and strong enough to reduce the impact of a blow and thus avoid any breakage of the skin. Unisex so it can be worn by either a man or a woman, the mask features vent holes at the ear and mouth for ease of breathing. The screen printed design featuring a ghoulish grinning skull is richly detailed and lets any observer know the wearer is as bad as they come!